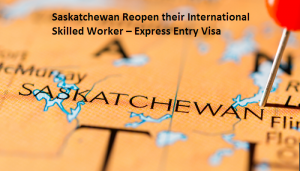 It has been announced that the province of Saskatchewan in Canada is to allow applicants to it’s International Skilled Worker – Express Entry visa prompting a flood of interest from around the world. Although only 500 new applications will be allowed there is expected to be strong competition to fill the vacancies. The programme has been reopened to fill a growing number of in-demand occupations that currently have a skills shortage in the province and it is hoped that a number of highly skilled workers will be encouraged to apply. In demand, skills include Computer and IT managers, Recreation, Sports and Fitness, Agriculture, Health Information Management and Mathematician and statisticians. There are of course a number of requirements for application and these include, but are not restricted to completing a language test, having completed one year of post-high school education or training or have strong work experience in any one of the in-demand skills that are currently included on the list. It is thought that demand for the applications will be extremely strong and that the places will be taken within days of the announcement. It is therefore suggested that applicants get completing their forms as a matter of urgency. The last opening of the category in January proved massively popular and this time round is expected. The subcategory is part of the Saskatchewan Immigrant nominee Program and allows those obtaining visas to settle permanently in the state and make a new life for themselves which is why the application process is so popular. There is currently no news on when the category may reopen following this current round of applications and those who miss out on this round of applications are encouraged to keep watching news sites and the Saskatchewan government sites for news of future openings and have their documentation in place in order to submit their applications as quickly as possible.